​"By an act of the general assembly, on January 22, 1835, a corporation was created and called "The Board of Directors of the Richmond Classical Institute." The object of the institute, as briefly set forth in the charter, was to afford instruction in the liberal arts and sciences. After securing the charter, no effective effort was made to establish a school in accordance with its provisions until 1843. At a meeting of the board of directors held on July 31, of that year, it was firmly resolved by the directors to carry the school under their control into operation. In accordance with the above resolution a committee was appointed to secure a suitable building and the service of a competent teacher. The basement of the old Methodist Episcopal church was secured by lease for two years. The school year was divided into two sessions of five months each, beginning with the first Monday in May and the first Monday in November of each year. On October 1, Rev. John R. Dundass was chosen president of the institution, and D. D. McBryar, professor of language and natural science. At a meeting of the board on January 6, 1845, it was found that a more spacious building was necessary. Accordingly committees were appointed to look out a site for the building and to secure subscription for the erection of a suitable house. The necessary funds were soon raised. Two lots were purchased from Joseph Talbott and one-half acre was donated by Thomas Hammond. On this site where now stands the graded school building of Richmond, was erected a two-story brick structure which was used as the " Richmond Classical Institute." The building was completed and dedicated in the latter part of 1845. A short time previous to this a committee had been appointed for the purpose of securing money with which to purchase a bell. The committee now reported the bell in its place. 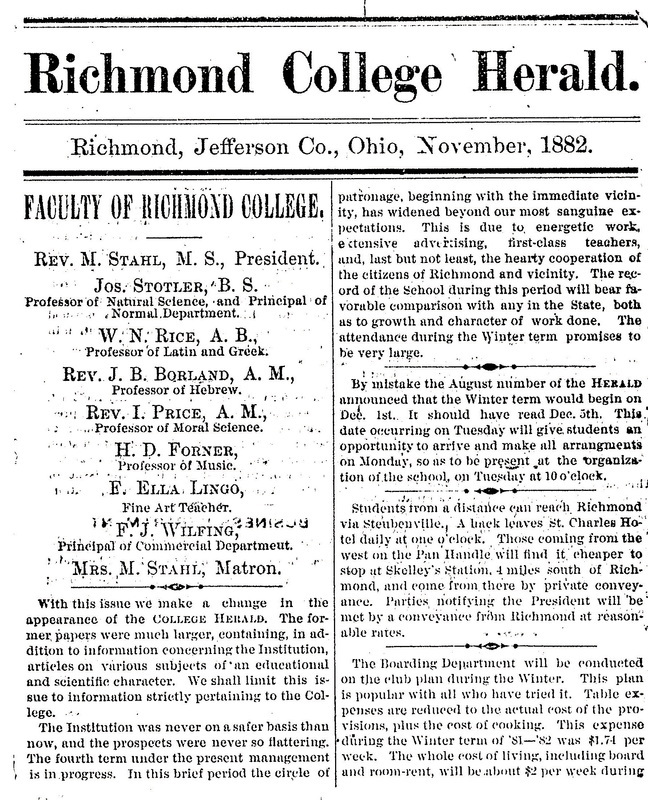 A change of name being thought advantageous to the institution at a meeting of the board on November 15th, 1847. the officers were authorized to petition the legislature to change the name from "Richmond Classical Institute" to "Richmond College." During the next session this was done, and the desired change made, and from that day to the present it has gone under the name of "Richmond College." On September 26, 1848, D. D. McBryar resigned the presidency of the college, and J. R. W. Sloane was elected instead. In the latter part of 1866, L. W. Ong and M. B. Riley took charge of the school, and on June 25, 1868, L. W. Ong received the presidency. On January 10, 1871, B. L. Crew was elected, and has since that time continued to hold the office of secretary. Under the presidency of L. W. Ong, the school continued until 1872, when steps were taken to raise subscription for the erection of a new college building and boarding hall. 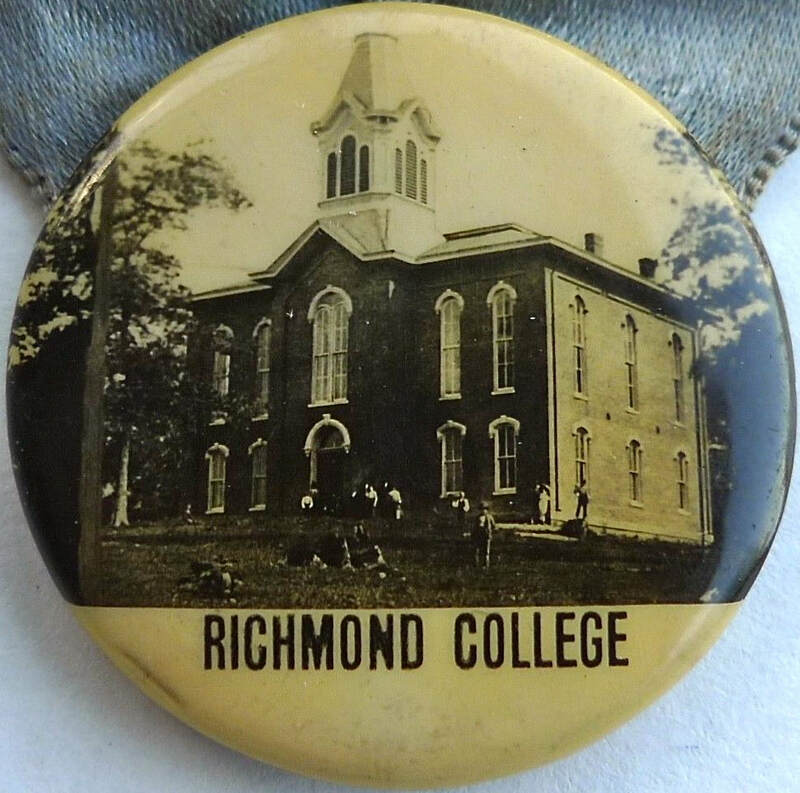 The old college building and grounds were sold to the village of Richmond for school purposes. A site was secured a short distance from the village of Richmond by the donation of one acre of ground by Lewis Ong, and the purchase of about eleven acres adjoining. On a beautiful mound on these grounds, under the direction of Prof. L. W. Ong, the building in which the school is now progressing, and the boarding hall which stands a few feet from the college, were erected. 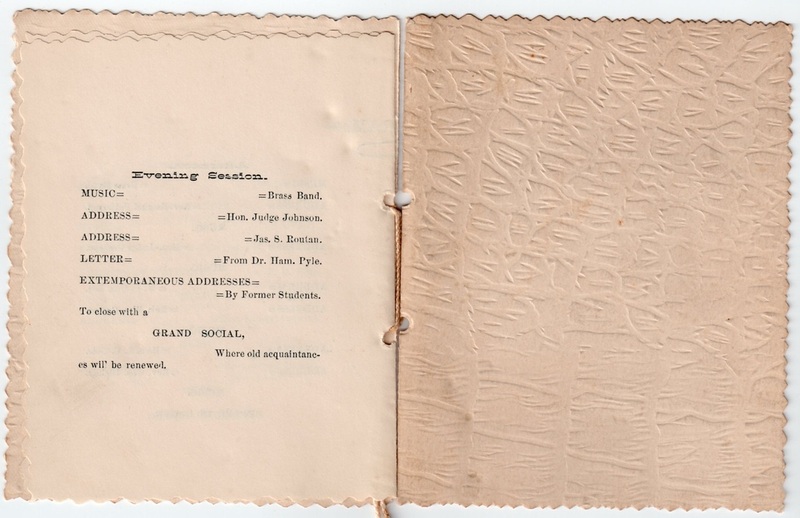 The corner stone of the college was laid with appropriate exercises on August 8, 1873. Revs. Sloan, Dickey, Marvin, and Watkins, delivered addresses on the occasion. The bell, which was purchased for the old college building in 1845, was now transferred to the new. On August 28, 1873, the new college building was dedicated. Prof. L. W. Ong continued in the presidency until June 5, 1877, when he was removed by death, leaving behind him a record unsurpassed, and even unequaled by any of his predecessors. He was a man that was honored and respected by all, having done such a grand and noble work in lifting the college out of its fallen condition, and had life been spared, doubtless the school would have continued to prosper and seen no more dark days. 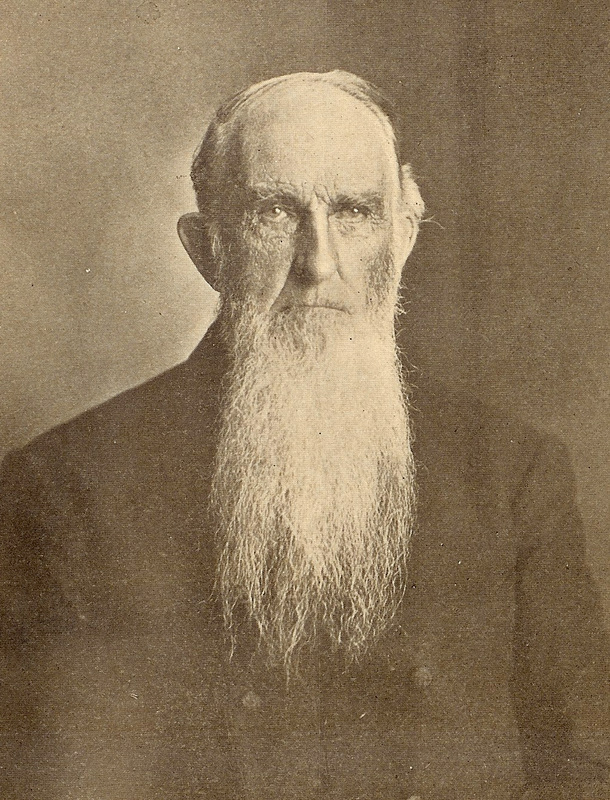 In 1877, Rev. 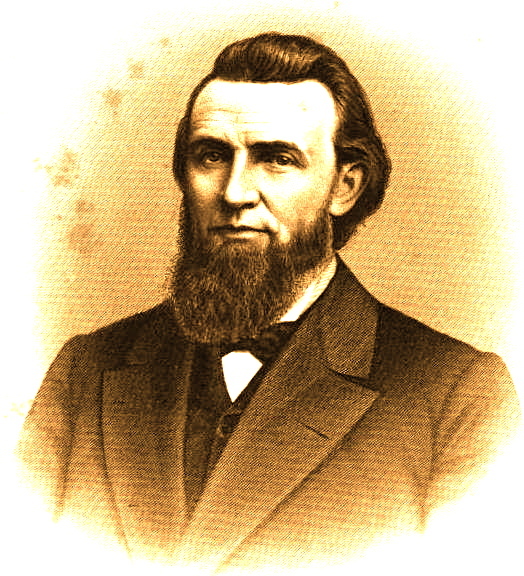 W. J. Brugh was elected president, who, resigning in 1878, was succeeded by S. S. Simpson. 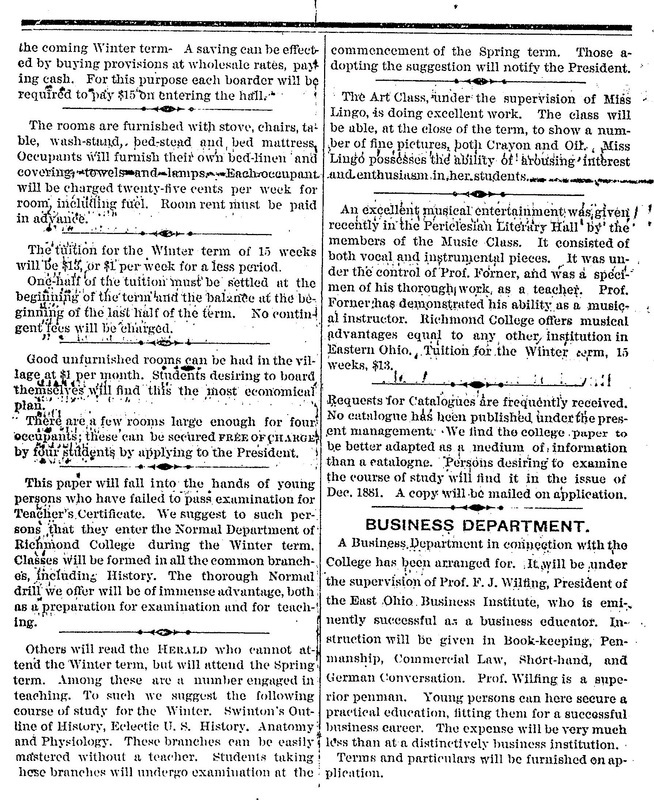 On August 23, 1886, Rev. S. C. Faris, having been elected president, continued the school for two years, when the property was purchased and repaired by Dr. George W. Macmillan, Ph. D., who was elected to the presidency and took charge on July 1, 1888, and who still holds the reins of the college with a firm and steady hand. 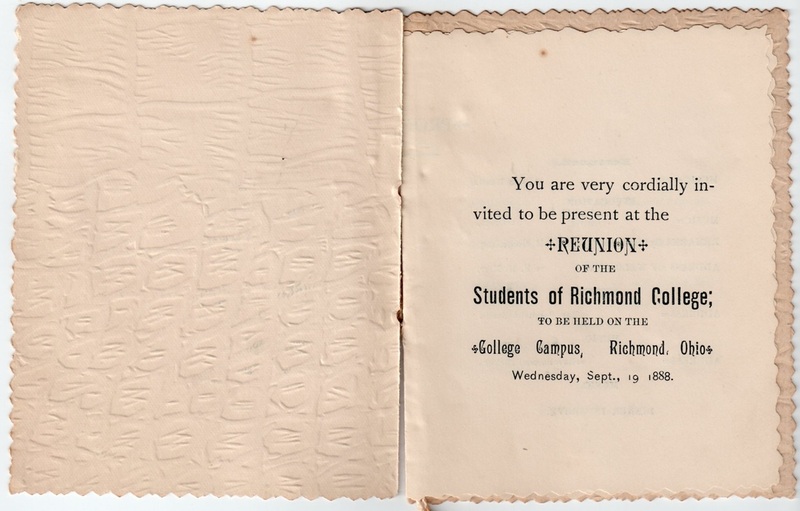 President Macmillan comes from a successful experience in the east, and has shown, in a little more than a year, that Richmond college is under a master's hand. Under the present management the school is growing, the students this year numbering something over 100, and the work done brings great credit to the school. Hundreds of young men and women have received instruction within its halls, receiving here the first impulse to a higher education, are now eminent members of the different professions, whilst many others receiving here that measure of education which fits them for the better enjoyment and exercise of the more ordinary duties of life, now live honored and useful members of society. The college has revived, and this revival means life. Let it be sounded at home and abroad that Richmond college still lives with more vigor and strength than ever before, and let the echo be carried back by the hundreds from far and near who desire a good education. May the same old bell continue to peal forth its chimes of old and stir up in the hearts of the young and rising generation that enthusiasm which prepares and befits them for active college life. 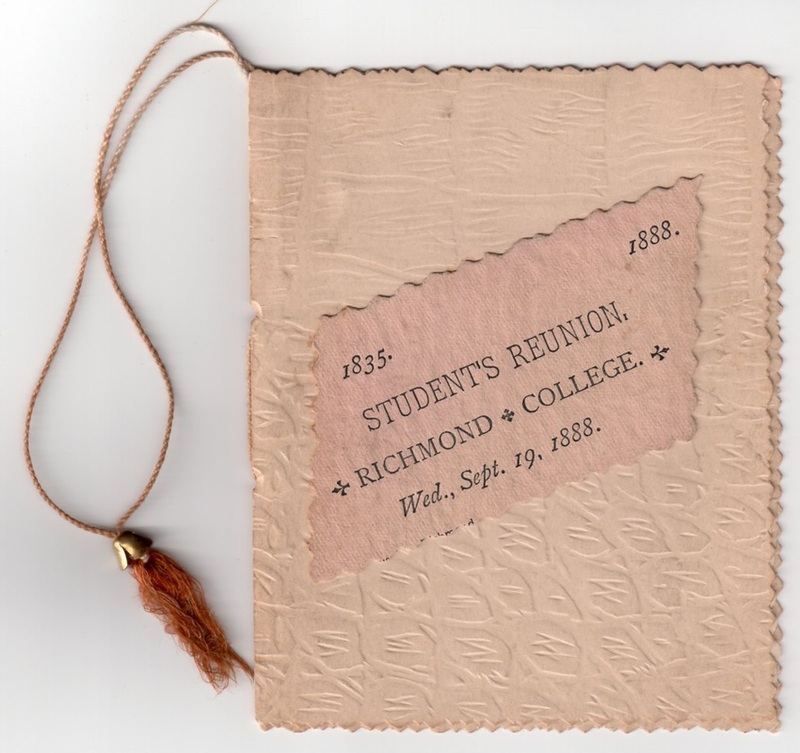 May the two words of the motto, "Religion and Science," go down through the ages as set forth in the seal of the college, hand in hand, and may this be but the dawning of a brighter day for the history of Richmond college." "During the summer  I had a severe attack of typhoid fever, from which I recovered with no evil effects. The disease spread to other members of the family, among them my sister Eliza, who died, deeply mourned and lamented. The autumn found me in Kentucky, whither I went to take charge of the school near Hopkinsville, Christian County, belonging to a clergyman whose name was Jones. The vicissitudes of that ill starred institution would fill a volume. Mr Jones sold out to a Mr Johnston and left at once for a visit to Louisville. Straightway a slave woman of Mr Johnston's set fire to the buildings, which were burned to the ground. This resulted in the breaking up of the school, which was largely composed of boys from the South. Accordingly, I, with three pupils, was sent to lodge with a neighbor, "Colonel" Moore, from whom we received kind treatment during the winter. During this period, having considerable leisure and favorable opportunities, I examined into the nature and workings of slavery. The result was a settled conviction of its enormity as a sin against God, and an outrage upon humanity. It was then that my determination was settled to do what little I could against it by word and deed, I only mean, of course that opinions I had held all my life were confirmed, and my future course determined. The half was never told of the evil of the system: the marvel is, that God's judgments were so long delayed. With such views, I could not conscientiously remain where the system prevailed; and learning that the academy at Richmond, Jefferson County, O., was without a principal, I therefore applied, and received the appointment. I left Kentucky early in March 1848. The people had been kind, and "Colonel" Moore was already exerting himself to form a school which would have been large and profitable. I bade good by with feelings of personal kindness. About a month later I entered upon my work in Richmond. The position was an agreeable one, but very arduous. The difficulty arose from the fact that they called the institution a college, and, with but two teachers, were actually attempting a college course. 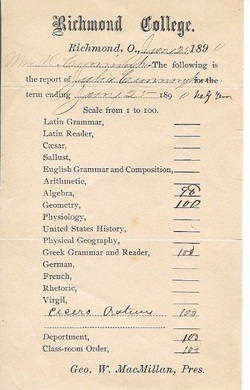 My predecessor had had recitations in Virgil, Horace, Juvenal, Xenophon, Thucydides, Euripides, etc., with corresponding classes in mathematics. There were boys from the village and neighborhood who could not afford to go from home; and was not the name of college as good in one place as another? and as to what the college is at which a man graduates, who would care to inquire? The able and studious man who had been principal before me had them up to the point of what was considered a full college course; and it would not do for me to let my work fall below his, especially as I was from Jefferson, and he from Washington then rival colleges, but since united. So my assistant took charge of the preparatory department, and I of the college. 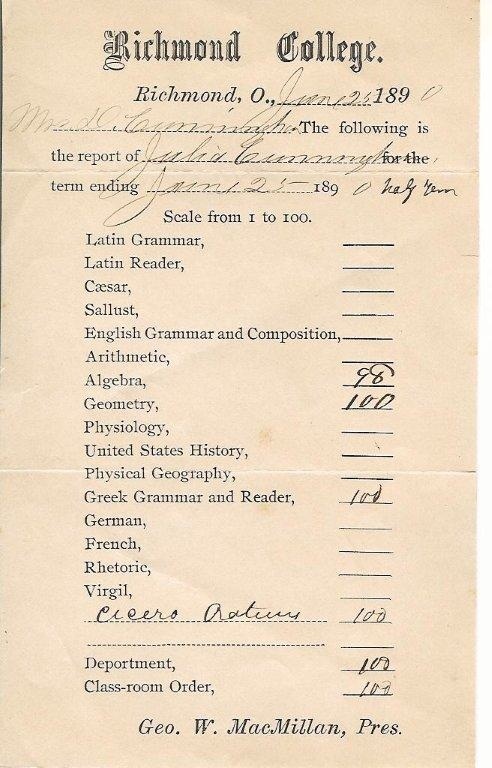 I had four classes a day in Latin, as many in Greek, and the same number in the higher mathematics, with logic, rhetoric, and a slight touch of moral and mental science thrown in. It is a sober reality, I taught as many as twelve classes in the day. But I liked the place: the country in the neighborhood was lovely, and the academy flourished. I was daily improving my own scholarship. The people were moral, and in intelligence above the average in country places. During the vacation, in October 1849, I was married to Margaret Anne Wylie Milligan, at the house of her brother McLeod, near New Alexandria, Westmoreland County, Penn. She was the only daughter of the Rev. James Milligan, my father's friend in Vermont and afterwards in Illinois. The marriage was in all respects a happy one. Feeling that I had spent sufficient time in teaching, and that I should commence my studies preparatory to the ministry, I resigned my position in Richmond, and determined to go to Northwood, Logan County, O., the site of Geneva Hall, an institution that had been founded as a college for Covenanters some year or two previously. The Theological Seminary had been located in the same place, and my purpose was to study theology. I left Richmond on the first of April 1851, I had then spent three years of hard labor, which was both profitable and pleasant; and I therefore parted from the little village with kindly feelings. Moreover, there were some associations of a tender and specially pleasant nature connected with it." "Carpets will not be furnished for the rooms. We would suggest that students bring carpet with them. It will only require 12 yards to carpet the small rooms. One pound of cotton will make a pillow much better than feathers. Six pounds will make a thin mattress to spread on the straw mattress. Cotton is soft as feathers and much more healthful. It would be a good idea to bring slippers to wear in the room. Linen should be marked by means of stencil plates. Washing done convenient to the Hall. Don't forget to bring umbrellas and overshoes. Umbrellas should be marked. Don't forget lamps and oil-cans. Mirror, clock and pictures will add much to the home-like appearance of the rooms. Leave novels and story-books at home. Bring all old text-books for reference. It is preferable for students to make their own arrangements about room-mates. Get some one in your vicinity to come with you. Lastly; come on Monday, so as to be present at the opening on Tuesday." 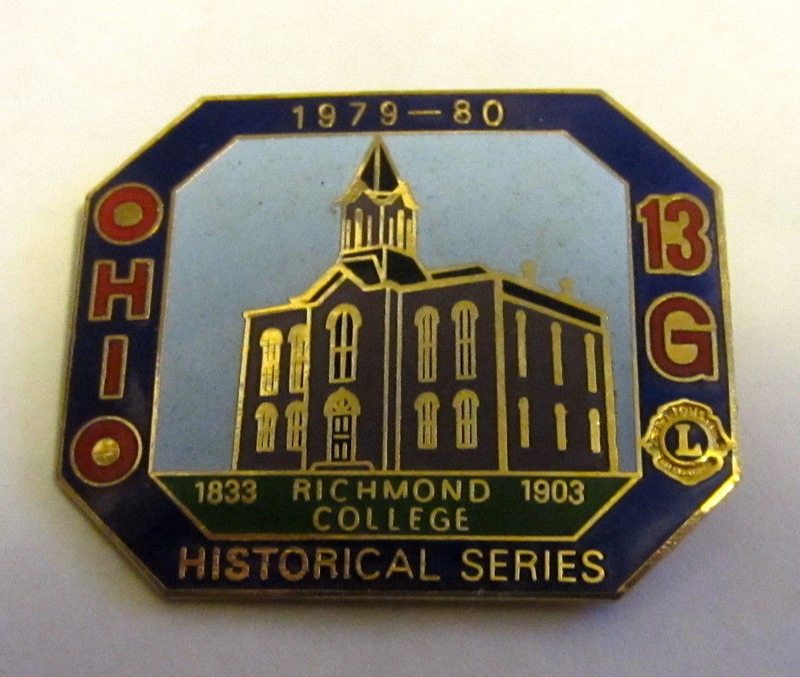 "Richmond college is the outgrowth of a select school taught in Richmond, Salem township, Jefferson county, in 1832 by Rev. J. C. Tidball. 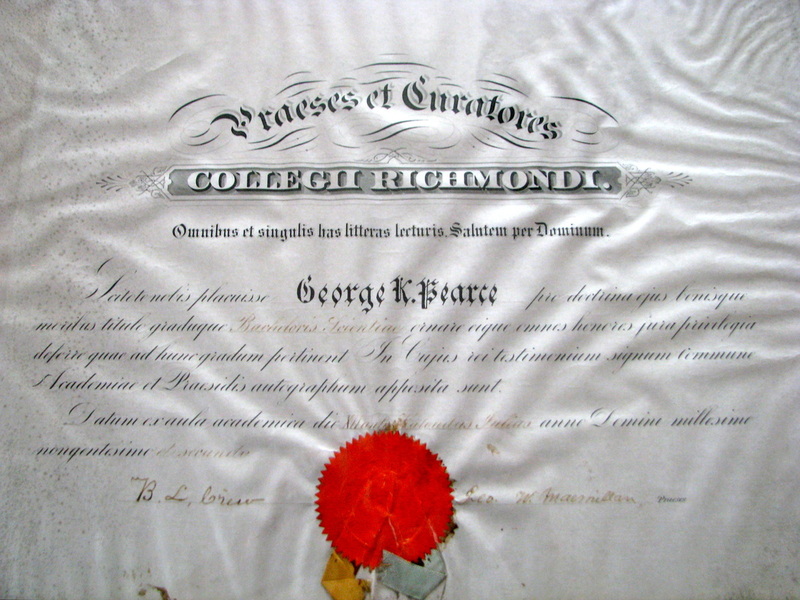 The charter was granted January 22, 1835, and Judge Thomas George, Isaac Shane, William Blackiston, Henry Crew, Stephen Ford, Thomas Orr, David Sloane, Nathaniel Myers, John Cook, William Farmer, Samuel Bell, A. T. Markle and James H Moore were directors; but the college was not really established until 1843. In October of that year, Rev. John R. Dundass was chosen President and D. D. McBryer, Professor of Languages and Natural Science. In 1845 a brick building, 32 x 45 feet, was erected for the accommodation of the college, on land bought from Joseph Talbott and on land donated by Thomas Howard. The Building Committee was composed of Thomas Barnes, E. M. Pyle, Henry Crew. In June 1840, John Comin was elected Professor of Languages and Moral Science, and William Sarver was chosen Professor of Mathematics and Natural Science. In 1846 D. D. McBryer was chosen President, and several chairs were added and filled as follows: Hebrew and Evidences of Christianity, Rev. William Lorimer; Ancient and Modern History, Rev. B. F. Sawhill. In September 1848, J. R. W. Sloane, (father of Prof. Sloane of Columbia college, author of the best life of Napoleon ever written, and other important works,) was elected President. In 1850 the Presbytery of Steubenville took the college under its charge, and Rev. Cyrus C. Riggs was chosen President, with Rev. W. Easton and J. R. W. Sloane added to the Faculty. The Presbytery held the college in charge only one year. 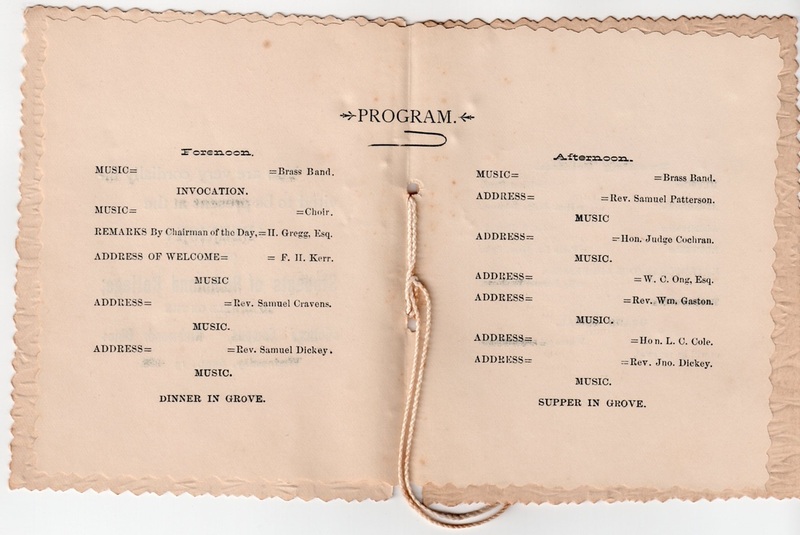 In 1854 the Pittsburg M. E. Conference took charge, and M. S. Bonafield and C. R. Slutz composed the Faculty with Rev. S. H. Nesbit, President. In 1860 Col. J. T. Holmes was elected President, which position he held two years, he then giving up the work to enter the Federal army. Since then the college has passed through many hands with varying success. In 1872, under the charge of Prof. Lewis Ong, larger buildings were erected, the corner stone having been laid August 8. Addresses were delivered on this occasion by Rev. J. R. W. Sloane, J. B. Dickey, John Marvin and W. B. Watkins. After Prof. Ong came Dr. G. W. McMillan who is now (1899) in charge." - From a Sketch of Richmond College written for "The Pathfinders of Jefferson County."